Snow over the weekend, and more coming today, has not slowed the pace of framing at the MoTrad House. 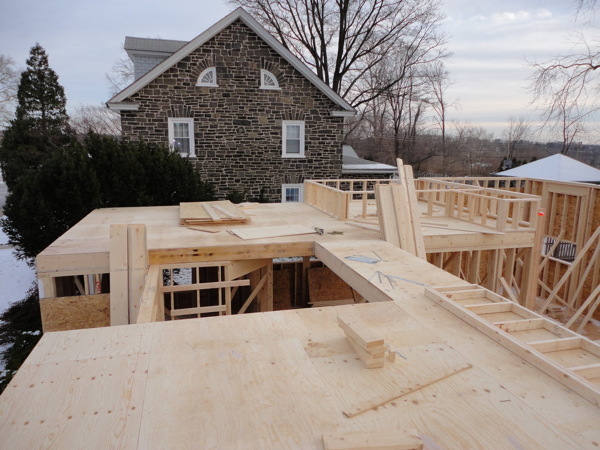 The main level of the second floor platform is on and decked, and I suppose we can expect the master bedroom level to follow shortly. I expected this project to move along more slowly than usual as the owner is doing GC duty himself. But I've been wrong at the framer is moving at a good clip, and the excavation and foundation work was well coordinated and happened quickly as well. More photos if you click through to read the rest.